William Henry Morgan was born on 17 Aug 1880 in 52a Swaton Road, Bow. His father Thomas had been born in Bristol and came to find work in London most probably at first labouring in the Docks. The addresses and job titles, shown in the censuses, indicate a steady rise in fortune. By 1891 the large family had moved to Terrace Road, Plaistow. The 1901 census shows that William aged 21 was a Friendly Society Clerk and his father had progressed from a Dock Foreman to a Wool Broker’s Clerk. 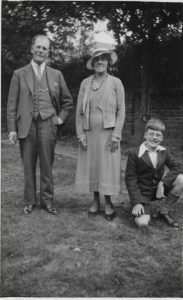 Everything indicates that William made steady progress in a numerate and literate career but there is little real evidence of the exams that he must have been studying for and passing, culminating him in becoming a fully qualified Incorporated Accountant in 1922. The attached photo is unlabelled but comes from William Morgan’s large family album. It seems it has to be him and we can estimate it was taken around 1905. The facial features tie in with the later known likenesses of him some twenty years later. The next major documented event in his life though, is his marriage to Emma Ida Palmer on 17 Aug 1908 in Southend. She was the daughter of Henry Edwin Palmer. The newspaper cutting opposite shows that there are strong middle class aspirations. Both families were second generation Londoners and had come from Bristol and Plymouth respectively to better their lives. 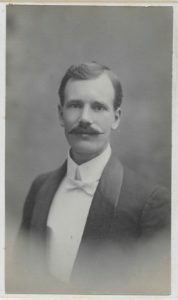 Frank Charles Sones (b 1871), who was to be killed as a civilian in the blitz in 1940, signed the marriage certificate – seemingly in the absence of the groom’s father. The April 1911 census shows William living with Emma in 13 Mitcham Road, East Ham and that he is employed in the Gas Works as a Clerk (Time Keeper) . This job is consistent with a medal in our possession from Beckton Gas Works. This is just a few months before the birth of their first daughter Winifred on 13 Aug 1911. It is a bit of a mystery as to what William did in the First World War. He would have been 34 at the outbreak with a young daughter – circumstances that would probably mean that he would not be rushing to join up despite the enormous social pressure. His only other child Donald Cecil Morgan was not born until 21 Sep 1922, but it seems unlikely that this gap was caused by any military service and certainly not abroad. There are two pieces of concrete documentary evidence. Firstly he is a witness at his sister Armoral‘s wedding in Ilford in Dec 1916 and secondly he is in attendance at his father’s death in Nov 1918, where he gives his full address in Ilford. It would appear then that the family had moved out to 129 Empress Avenue, Ilford, then a more affluent area with larger houses, possibly as early as 1914. He became an associate of John Richard Woodley, (b 1867) at around this time. John Woodley was an incorporated Accountant and this was an important stepping stone to William’s full qualification. Woodley’s office address was recorded as being in 34 Gresham Street in the City of London from about 1920. William attained full partnership with John Woodley in about 1927 and the business was styled John R Woodley Morgan and Co. This date probably coincides with the family moving to a larger house in 52 Selborne Road, Ilford in around 1928. The London Gazette records that the partnership was finally dissolved on 27 Mar 1935 when Mr Woodley would have been 67. He died before 1938. Shortly after, William Henry Morgan formed a partnership with William Back and Morgan Back and Co was formed with offices in the same Gresham Street location. The staff was probably about half a dozen. At the start of the war, his son Donald joined and started his training. By then relations between William and his wife had deteriorated and he spent little time at home in Ilford, allegedly because of the bombing. A large number of photos survive from the 1920’s and 1930’s. When his daughter Winnie married in 1937 the young couple lived with the bride’s parents and their two eldest daughters were brought up through the war with their mother and grandmother in the same Ilford household. Indeed Donald was only 16 years older than his eldest niece. Memories from this period are of a genial and humorous man. Many photos show him with a cigarette in hand. Some correspondence has survived between William and his son Donald in 1946 when the latter was posted on military service to India. However by 1946 he was increasing ill and lost his voice due to cancer of the larynx. He died in St Mary’s Hospital Paddington on 26 April 1947. He was buried in Barkingside cemetery plot 4735. His will shows that whilst he provided well for his widow, a sixth of his residual estate was to pass to Ada Lucy Sole, a lady whose Paddington address (4 Westbourne Grove) he shared during the bombing. This was perhaps the main reason for his prolonged absences from his extended family out in Ilford. Two thirds of his residual estate was left to his son as designated capital in the accountancy partnership of Morgan Back and Co with the desire that his son would eventually become partner once fully qualified.